The European Union delegation to Korea and Korea’s Ministry of Strategy and Finance launched a project last week to tackle greenhouse gas emissions as part of bilateral cooperation to curb climate change. The emissions trading scheme cooperation project -- worth over 3.5 million euros ($3.87 million) -- will run until January 2019. The EU will offer technical assistance and expertise to Korea through consultations, workshops and study visits to the EU. Through the three-year initiative, both sides will strive to reduce greenhouse gas discharge by roughly 40 percent of the 1990s level until 2030. Emissions trading, known as “cap and trade,” is a government-mandated, market-based approach to curtailing pollution by providing economic incentives for emissions reduction. A government body allocates or sells a certain number of permits to enterprises for discharging specified amount of pollutants within a given time period. Companies are required to hold permits in equal amount to their emissions and firms that plan to increase their emissions are required to buy permits from others willing to sell. Designed to provide companies with flexibility in emissions, the system also stimulates technological innovation and economic growth, according to analysts. Established in 2005, the EU emissions trading system is the world’s first and largest scheme of its kind, contributing cardinally to the United Nations climate agreement that was forged last December to limit global warming. The Korea emissions trading system was set up last year, marking the first such nationwide initiative in East Asia. 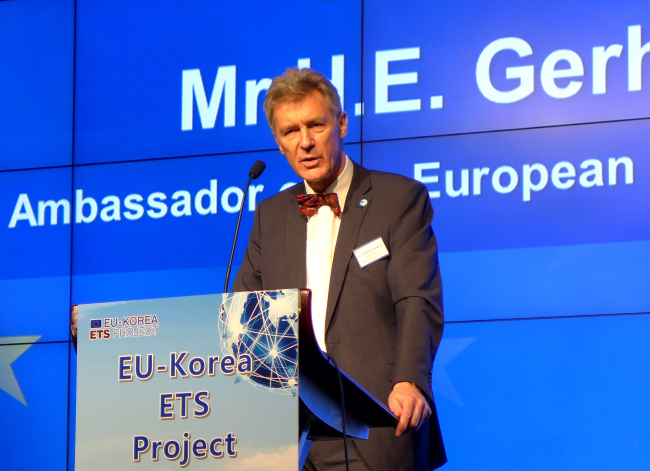 With more than a decade of experience, the EU is “well placed” to support Korea and share its experience, he added. The collaborative project will focus on implementing and operating the first phase of Korea’s emissions trading system until May 2017, and developing a framework for the second phase until January 2019. Through an international consortium, the public sector will receive technical, strategic and governance guidance for implementation and development, while the private sector will gain know-how on compliance and new mitigation technologies. Other participating agencies are the Ministry of Environment, Ministry of Agriculture, Food and Rural Affairs, Ministry of Trade, Industry and Energy and Ministry of Land, Infrastructure and Transport. In an interview with The Korea Herald, Sabathil said emissions trading is “the most cost-effective way” to cut greenhouse, while providing flexibility to companies in trading allowances or reducing emission. As a mandatory legislation, the EU emissions trading system will help Europe reduce emissions by 40 percent of the 1990s levels, up the share of renewable energies by 27 percent and improve energy efficiency by 27 percent by 2030, according to the delegation. Regarding the climate agreement, which was signed in New York in April, the ambassador said it will enter into force when at least 55 countries representing at minimum 55 percent of global emissions have pushed through domestic ratification. Noting that national ratification must precede the bloc’s efforts, he added that the EU has devised new policies and updated existing directives, such as decarbonizing the transport sector and revising the energy efficiency directive. The EU and Korea also operate other ventures in sustainable development, including the EU Green Gateway Program, which aims to enhance the presence of small and medium-sized European enterprises in green technology in Korea; and city-to-city arrangements for a low-carbon economy.